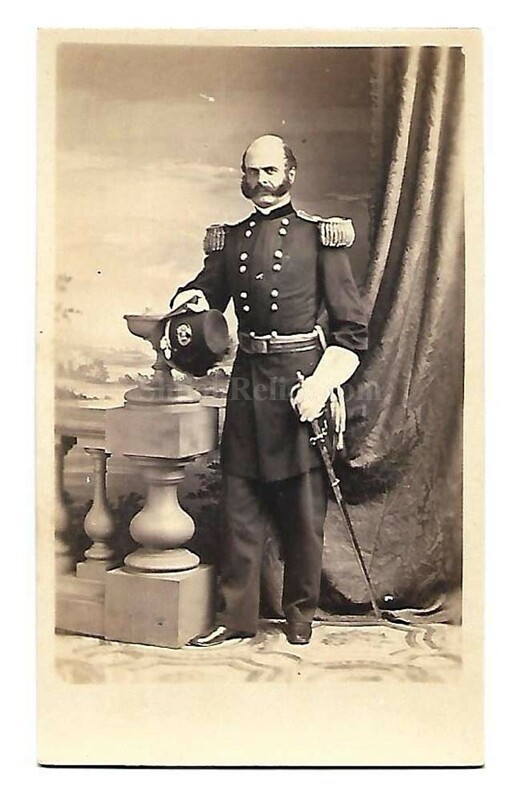 This is an authentic CDV image of Union General Ambrose Everett Burnside (1824-1881). Burnside was born in Liberty, Indiana on May 23rd 1824. Burnside attended West point and graduated in 1847 as a Brevet Second Lieutenant in the 2nd Artillery. He served during the Mexican War but mainly did garrison duty. Burnside resigned his commission in 1853 and went to Bristol, Rhode Island where he went into the gun business. It was here that he produced the first of the famous carbines to carry his name. He didn't do very well at the business and the guns was latter produced without him but still bore his name. Before the war he went back to the army and was a major General of the state militia. He was a brigade commander at first Manassas and was appointed as a Brigadier General of volunteers on August 6th 1861. He served in that post until March of 1862 when Lincoln appointed him as a Major General of volunteers. At Antietam he was in charge of the horrible slaughter of his troops trying to cross a bridge that would forever be known as Burnside's Bridge. He had several equally unsuccessful battles and was relieved of command and he was sent to the Department of the Ohio. 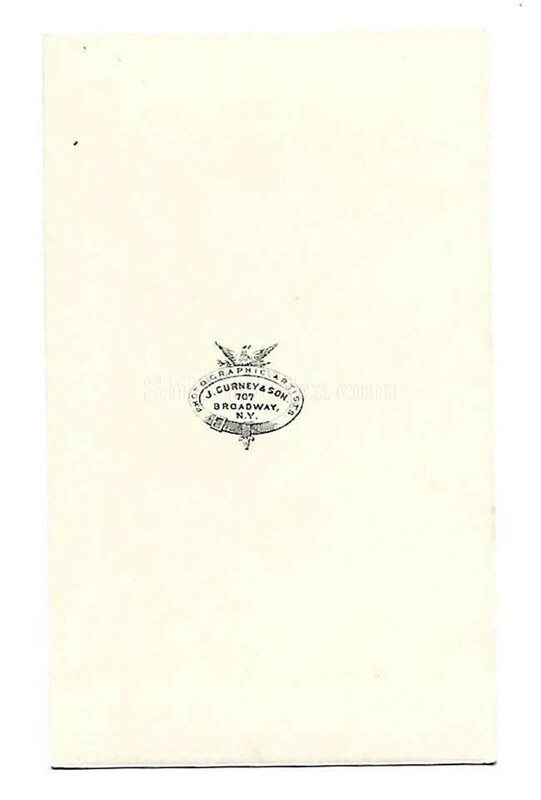 He resigned from service on April 15th 1865. Three times he would be elected the Governor of Rhode Island until he died in 1881. He is also well known for his sideburns for which he is credited and his name helped add title. 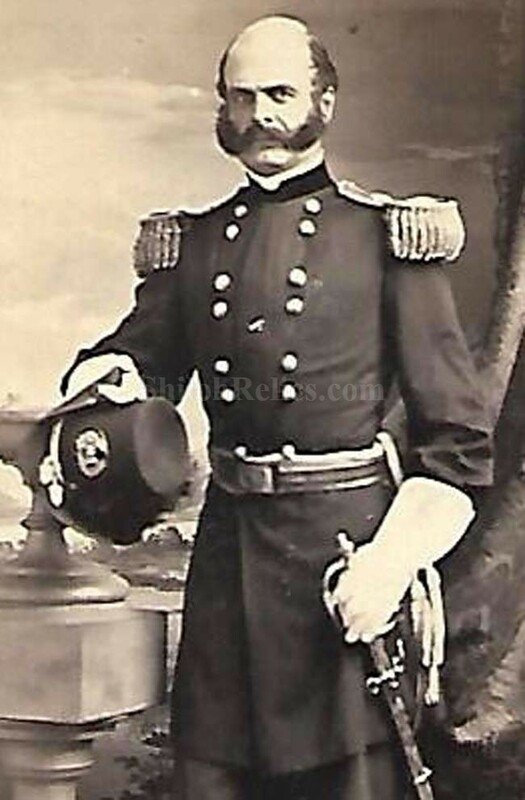 It is a nice clear CDV of the General in his best dress uniform. The overall size of a CDV image is approximately 2.5 inches by 4 inches in size. The back of this card has the desirable photographer mark of the Guernsey firm in New York City. It is a fine original CDV that will make a solid addition to any Civil War collection.